There are many things to consider when choosing an estate agent, whether you live in the Berkhamsted and Tring area or anywhere else. When you invite different estate agents to visit your home to give their views on its value, it’s well worth asking some simple questions about exactly how things work once you’ve given the company of your choice the go-ahead. A firm foundation of prestige marketing materials – and an in-depth knowledge of each available property – is where we start to make sure we capture as many enquiries as possible, and that we make of the most of them when they come in. At Nash Partnership, there are five main steps we take to set your home up correctly for a successful sale from day one. To ensure your property is marketed with complete accuracy, a professional floor plan is drawn up on every home we have for sale. This guarantees total certainty of size and allows potential buyers to easily refer back to the layout after viewings without trying to remember which rooms leads off where. Floor plans help people see whether the layout of your property is suitable for their lifestyle before they even book a viewing, which reduces time on wasted appointments and maximises relevant enquiries. Floor plans also demonstrate whether someone could make changes to the layout, sometimes producing leads from unexpected quarters. Of course, it’s not just the interior layout where dimensions matter: the garden and grounds should also be properly measured as well to avoid disputes - we recently met someone who’d been paying a price per acre for 20 years to have their 7 acres mown, only to discover their garden was in fact 4 acres! Team visits are an essential component in the marketing of any property for sale. We think it’s vital that the sales people who are representing your home have actually been inside and are familiar with the layout, specification, condition and any potential. Whether you instruct our Berkhamsted or Tring office, the sales team will visit your property so you can put faces to the names of people calling you to arrange viewings, discuss feedback and negotiate offers. The team visit is also a crucial opportunity for you to wax lyrical on all the good stuff about living in your home; what first drew you to it when you bought it; how you’ve lived in it and how you’ve enjoyed it since moving in. Nothing grabs a potential buyer’s attention more than the photography. It’s your first shot – and often only shot – at grabbing someone’s initial interest as they scroll through the property portals. The lead image, also known as the hero image, could be the difference between attracting the right person and losing them to another property, so we often employ specialist photographers. Using a combination of wide angle and close-up shots, we demonstrate not just the rooms within a property but also the quality of the fittings. If it’s a rainy day, we’ll come back again for the exterior shots to make sure your property is presented, quite literally, in its best possible light. And for larger plots we’ll make use of drone photography to get up high and show off the grounds in a way not possible to capture on the ground. One size most definitely does not fit all. We take the time to produce a description of your property that is both full bodied and full of flavour. We’ll talk to you about what makes your home special to you and ask about any improvements you’ve made; you will not be disappointed. This doesn’t mean unnecessarily flowery texts, but it does mean evocative and enthusiastic descriptions that give and accurate and alluring representation of your property to potential buyers. There is no question that a high quality physical brochure adds an element of prestige to the marketing of any property. They they are still heavily favoured by buyers as a tactile and larger addition to reading everything on a small handheld screen; a smartphone simply can’t display images or floor plans in such a large and arresting format. 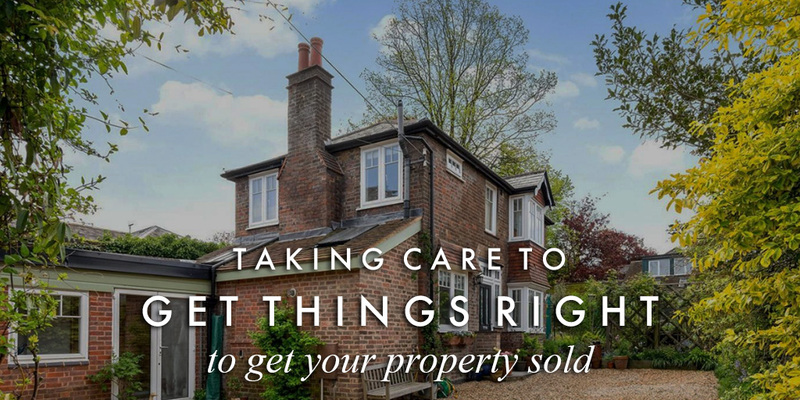 Berkhamsted, Tring and the surrounding villages have an enviable stock of high quality property that warrants a superior treatment to achieve the best result. With these five steps in place, your property sale stands the best chance of success from the outset.